Seriously? There was no way I could pass up this photo op at lunch today. 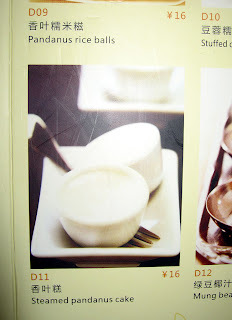 A couple of interesting menu choices I encountered on my recent trip to Dongguan City, China. As always, these are my own original photos. Panda what? Um... I thought those were endangered or something. I guess "steamed" sounds better than "steaming" in this case. You know, if I have to eat intestinal fat bone, it's always nicer with harsh flavors. One of the nice things about southern China is its diversity of food offerings. Many people living in this area have come from surrounding provinces looking for work, in the process creating a market for all varieties of Chinese cuisine. 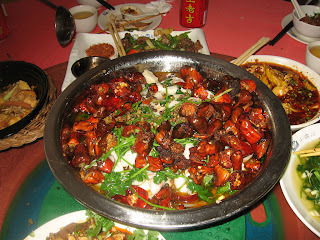 Just around the corner from where I’m staying is a small Sichuan place I’ve wanted to try for some time, Xiao Sichuan. We decided to take a break from drinking at the fire hose of Cantonese food, as we typically do when we come here, and give this place a try. 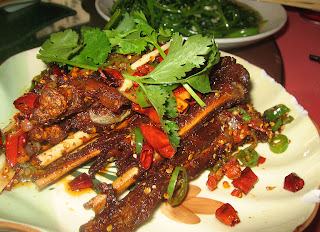 Unless you live in a cave somewhere, you probably know that Sichuan food is famous for its fiery bite (all apologies to the Geico cavemen). But you may be surprised to know that heat is only half of the equation. 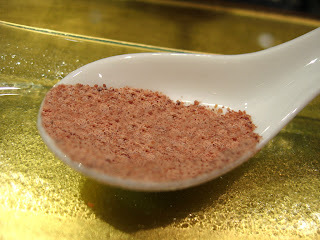 “Ma la” is the term that Chinese use to describe the unique blend of capsaicin induced heat in combination with the numbing action of the eponymous Sichuan peppercorn. Not actually related to our old friend black pepper, the Sichuan peppercorn is the flower/seed pod of a variety of prickly ash tree – hence it’s Chinese name, “hua jiao” (flower pepper). It’s assertive, citrusy flavor is just the beginning, as it contains the chemical hydroxy-alpha-sanshool, which causes localized numbness. 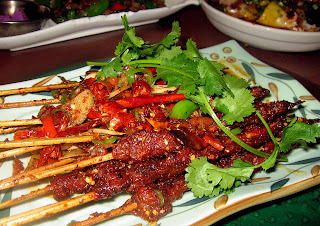 This tingly sensation together with spicy heat is the hallmark of Sichuan cuisine. I have to admit that I am not really sure what half of this stuff was, despite my best efforts to find out. So I’ll tell you what I know, but my descriptions are probably going to be pretty lame. One thing I do know quite well though – this food was delicious, and cheap too. 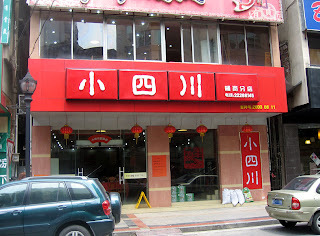 One of 3 Dongguan City Xiao Sichuan locations - the name may mean "little Sichuan," but the flavors sure were big. Rich, fatty pork was cooked slowly until meltingly soft was served over a bed of dried preserved leafy greens. This was a nice way to start things out and ease the chili-phoebes in gently, as it was one of the few dishes that wasn’t really spicy. Loaded with flavor, the lamb was coated in a cumin based spice rub, with just enough hot pepper to give your lips a buzz. The meat was amazingly tender, too. It was really a phenomenal plate of food, probably my favorite of everything we had. I could have pounded down this whole plate. My second favorite after the lamb, the tender meat was still on the bones, giving us the chance to play barbarian as we devoured these tasty morsels. The taste was really, well, porky - just like pork should taste. I piled up quite the boneyard, but still can’t really explain just what was so unique about this item. But I loved it. 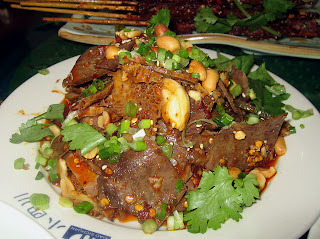 A pile of thinly sliced offal was dressed up with a chili oil sauce, Sichuan peppercorn, some nuts, and cilantro. This is a pretty traditional dish that I’ve even found back in the States. The tongue, despite what you may think (you know who you are), has a nice rich beefy taste, so get over it. The tripe… well, the texture can be off putting. Okay, it is like chewing a rubber band made of cartilage. If you can get past that, the taste is actually pretty mild. 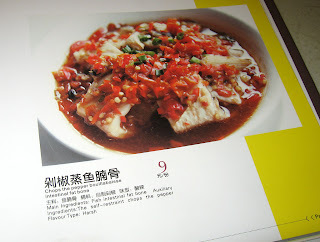 Our table was quite happy with this soup, which featured a whole “water fish,” cut into paper thin slices. Tangy and intense, the broth was infused with mounds of citrusy Sichuan peppercorns. The humongo pile of dried chilies on top looked menacing, but did not overpower the light flavor of the fish. As with many of these dishes, cilantro added its distinctive flavor to the mix. A version of this dish can be ordered from many restaurants here, but this version is one of the best I’ve had. 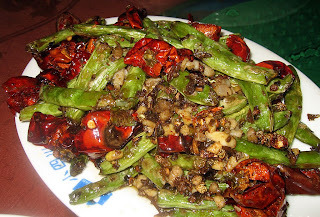 Despite the fierce looking dried chilies, this dish was actually not that spicy. There has got to be something special seasoning the beans. They tasted a little salty, but there was an overwhelming savory enhanced bean flavor that was totally addicting. Maybe a hit of MSG was used to boost the umami??? The Chinese name for this dish is literally “mouth water chicken.” So does that mean “salivating chicken?” “Chicken saliva?” Or maybe something more innocuous like “mouth watering chicken.” In China, you can never be too sure. Either way, this cold dish was moderately spicy, with those mouth numbing peppercorns once again. It had a distinctive flavor that was a common thread through many of the dishes, but I couldn’t begin to tell you exactly what it was. 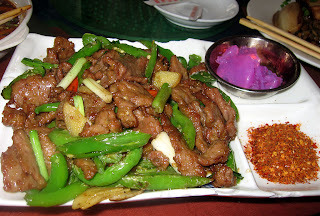 So this beef was served stir fried with fresh hot peppers, but the heat didn’t stop there. No, no, in the bottom right corner of the plate you can see a dish of crushed red chilies for dipping to taste. Above that was flaming sterno to wave your meat through and add a touch of char before scarfing down. This was another delicious dish, but be careful! The manual chili application may lead the careless diner to OD. Perhaps the most impressive thing about this lunch was the value. Most plates shown were about $4, with just the fish reaching a lofty $9. Beats a happy meal any day of the week. As spicy as some of the dishes were, I have to admit that I was expecting much worse. I even asked if they toned it down for us westerners, but we were assured that they did not. Although each item individually maxed out at a solid “medium” on the pepper scale, the cumulative effect left a lingering tingly sensation around my lips and tongue. According to one of my Chinese colleagues (a Sichuan native), the food would have been considerably more spicy in her hometown. Here’s to visiting someday - I look forward to the challenge. 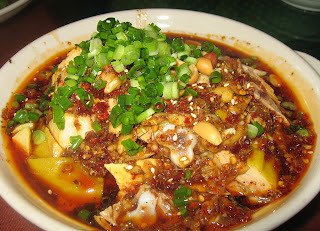 But in the mean time, whenever I come to Dongguan, I'll be stopping by Xiao Sichuan. Much has been written about Boston’s culinary sensation, Tim and Nancy Cushman's O Ya. A relative newcomer, I first gazed upon the words "O Ya" just last year while reading an in-flight magazine, where it showed up on somebody's list as one of the top new restaurants in the world. 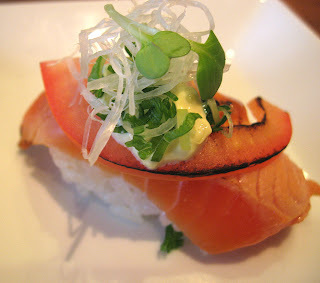 O Ya's modern-American-Japanese-inspired food is right in my wheelhouse. And given that it is also right in my backyard (well, globally speaking), there was no way I couldn’t go check it out. I made my way down Boston’s East Street, a tiny, nondescript side street that appears in all ways unremarkable. Tucked away in the heart of downtown, it is less than a minute’s walk from South Station and it’s chaos of frantic commuters, who pass every day, unaware of their brush with culinary magic. A small sign next to a single lantern read “o ya,” with faint Japanese characters in the background. Around the corner, down an even smaller alley, was a weathered wooden door, strikingly reminiscent of Kyoto and its traditional architecture. This had to be it. 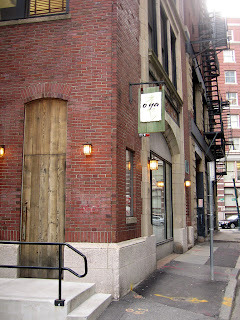 O Ya's discreet entrance makes customers feel like they've stumbled upon a great secret. I grabbed the smooth handle and pulled it open with nervous anticipation. A funny mix of conflicting emotions came over me – tremendous expectation and its shackled compliment, fear of disappointment. To say that I went to O Ya to eat dinner would be somewhat like saying I went to the Louvre to see some pictures. Or, you remember that Mozart guy, he wrote some nice tunes, didn't he? Could any restaurant live up to the mammoth expectations I had? Would it even be fair to expect one to? The restaurant was much smaller inside than I was expecting, with just 4 or 5 small tables and a few seats along the sushi bar. It was intimate and cozy, but most surprisingly, it was quite relaxed and casual. Our server, Anna Li (sp? sorry! 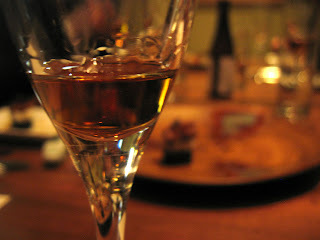 ), was warm and welcoming, and made the evening feel more like I was hanging out at a friend's place rather than- feeling lucky to be allowed into culinary nirvana. We decided to go the obvious route and ask for the omakase, leaving the selections up to the chef. Same for the sake as well, as the in-house expertise in this arena in particular is well chronicled. If you’re anything like me, you’re probably ready for me to shut up and show you some pictures. So let’s get to it! A light and fresh way to start things off. 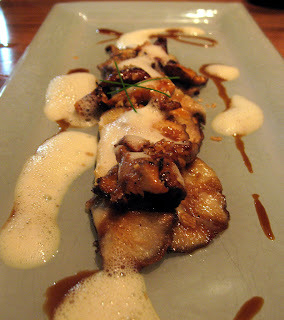 I love the creaminess of Kumamotos, which was contrasted nicely with a light vinaigrette. The cucumber added a nice crunch, and it's clean, fresh taste tamed the sweetness of the watermelon. With one bite, I knew the evening was off to a good start. With our taste buds awakened, we were next treated to an progression of nigiri sushi. And of course, I can't mention sushi without commenting on the preparation of the sushi rice, which was absolutely flawless. Nothing wrankles me more than poorly prepared sumeshi. After all, THAT'S WHAT SUSHI IS! Anyways. 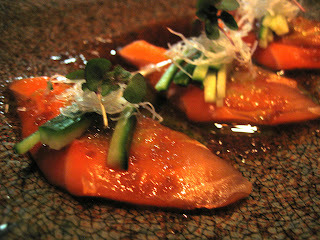 You had me at hamachi, which was briefly torched to add complexity, a technique used on many items at O Ya. Here it accentuatess the oilyness of the fish (a good thing) which helps it stand up to the spiciness of the mousse. Seriously, wow. One of my favorite tastes of the night. As I tasted this, I instantly thought of a BLT in sushi form. The combination of the fattiness of the salamon and the smoked salt was somewhat remeniscient of bacon. Of course, the tomato and the aioli become the logical accompaniments. What a great idea. 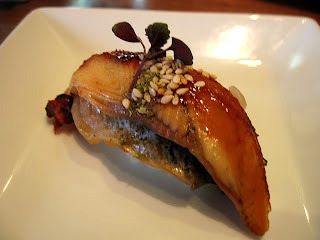 A nice enough take on the traditional grilled eel with eel sauce (kabayaki), but this item didn't quite deliver the flavor that its description suggested. Both Thai basil and sansho (Sichuan peppercorn) pack bright, intense flavors, which I thought would be a nice counterpoint for the sticky sweetness of kabayaki. The potential was high, but these flavors just didn't sing here. The eel itself was nicely cooked. I managed to snap free from my substance induced stupor to actually eat it, and boy was it good. An explosion of truffle flavor coated my mouth and olfactory sensors for the first 3 chews before finally stepping aside to reveal the oily crunch of a beautifully prepared potato crisp. "Oh yeah, there's a potato chip in here too," I remember thinking to myself. 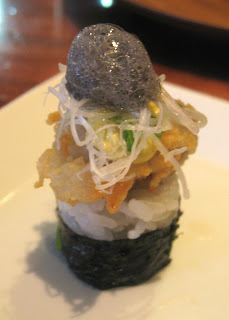 And as tasty as it was, I thought it actually worked surprisingly well as a sushi garnish. This was a big hit with our table, and one of the standouts of the night. 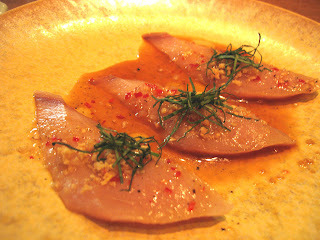 A nice bite of wild tuna, simply garnished and briefly hit with the blowtorch. The flavor profile was comparatively straightforward on this one, letting the quality of the tuna show through. Crispy, briny, creamy, and, well, fried! This bite was perfectly conceived, and as beautiful to look at as it was tasty to eat. This was hands down another group favorite. I could have eaten a dozen of these, called it a night, and gone home happy. Okay, slight exaggeration. Another nice bite, with a touch of wasabi and shiso to add some zing. This one was good, but not outstanding among the items we had. And with that, we were done with nigiri and moved on to a selection of sashimi courses. No time was wasted on fluff as we jumped right in and were treated to some beautiful sea urchin, or uni, to start things off. Okay all you sea urchin haters out there, this is the moment to put your palate to the test once and for all. I defy you not to like this! 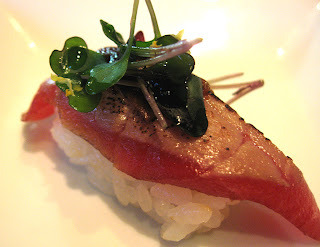 Shima aji (jackfish) is meaty and bold, a nice contrast for the silky, fruity sea urchin. Nice idea with the cevice vinaigrette - it balances the richness of these two items. Nothing sends my heart racing with anticipation faster than the o-word. Otoro of course... Uuuhm... What were you thinking? It's impossible for a beautiful slab of prime tuna belly like this not to send shivers down your back. And with a heap of mild onion garnish to cut the fattiness, it did just that. I'm just saying. 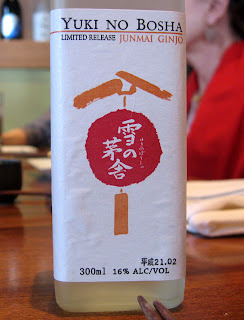 I expected a more exotic and powerful burst of flavor, with the yuzu kosho called out. There was a nice lingering spiciness, but overall this one was just okay for me. 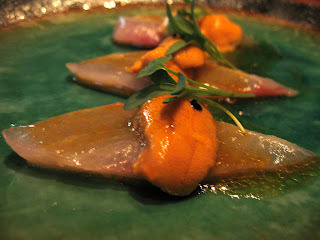 Taking a page out of the southeast Asian playbook, these vibrant flavors really enhanced this beautiful hamachi. A little sweet, a little sour, and a little heat to balance out the rich fattiness. And the Thai basil/crispy shallot garnish? So money. I was greeted by another wafting cloud of heavenly truffles upon arrival of this plate. I would have never thought to combine this group of tastes (which isn't saying much), but they worked beautifully together. Our table was somewhat divided on this dish, but I was firmly in the 'totally love it' camp. It was time to hit up the back side of the menu and try some cooked items. And as much as I was looking forward to seeing what they could do with a little heat, I was sad to see the end of the sashimi flow. One bite of this lovely salad, and I was instantly transported to the New England seaside on a hot summer day. Seriously, this reminded me of a sophisticated take on the classic lobster roll. Avocado adds richness in place of heavy mayo, and the cucumber gelee (really more like a pudding) was wonderfully light and soothing. Our first land dwelling protein of the night packed an explosion of flavor. The crispy exterior added a nice crunch for textural interest to the tender, juicy chicken. I especially loved the lightness of the homemade kimchee. 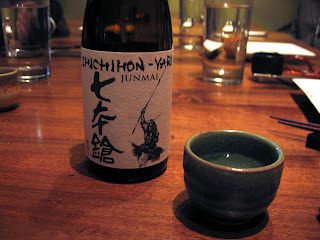 Nicely grilled, and beautifully complimented with the herb oil and fantastic sesame froth. Mushroom lovers should make sure not to miss this one. For me - I enjoyed it, but couldn't help but think that I could have been eating another piece of sashimi instead. 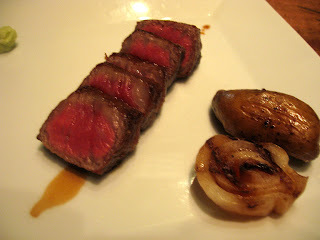 I've raved before about the magic of Wagyu beef. 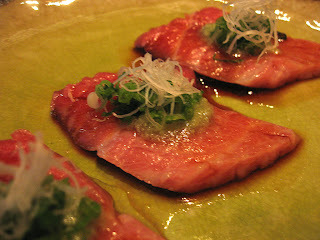 And I was most greatful to be amazed once again at the richness and full beefy flavor of real Japanese Wagyu. 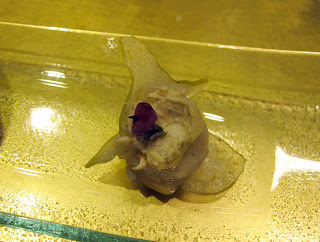 Fresh wasabi was a nice condiment to pair with it - so much more floral and subtle than the fake stuff. The smoked potato was a blast from my past, remeniscient of foil wrapped potatoes cooked on a campfire. It brought a smile to my face. 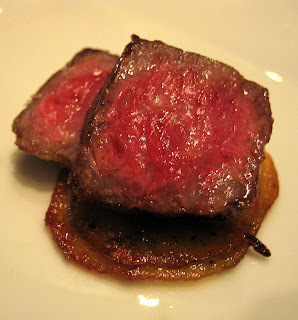 As nice as the first plate of Wagyu was, this is the one I will lust after to my grave. No matter how much of this I could eat, I would always want the same thing - just one more bite. I warn you - if you are a meat and potatoes kind of person, do not eat this without considering the consequences! Like Neo and the red pill, once you partake, there is no returning to beef innocence and naïveté. Be forewarned. Saved for the last course of the evening was O Ya's signature dish - one I was looking forward to all night long. 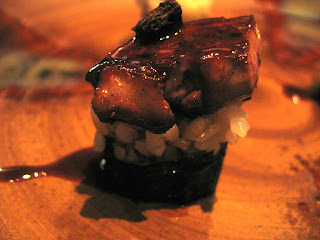 Obscenely rich and decadent, seared foie gras was accented with a semisweet, semisalty chocolate/raisin/soy glaze - a beautiful pairing. 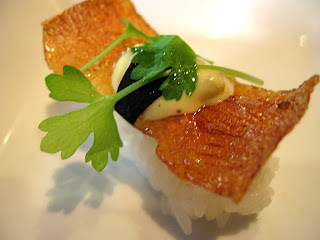 We all noticed that the rice noticeably cut the richness of the foie. Some at the table were appreciative of this, feeling that foie can be too rich. But for me, it muted the very thing about foie gras I love. Not saying I wouldn't get this again - the taste was phenomenal - I just think it would be even better without the rice. 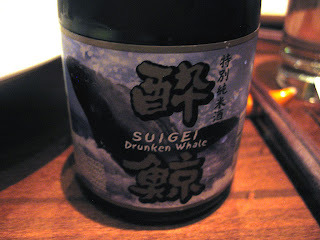 Dark, intense, and amazingly Port-like, with a raisiny quality that nicely echoed the foie preparation. The color was a deep amber, and it had other flavor components typically derived from storage in wood, despite spending it's full 8 year aging period in stainless. 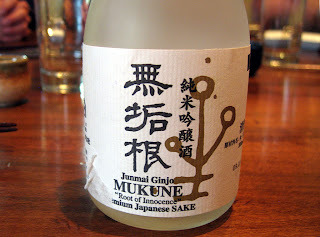 This was truly a remarkable sake, and certainly the most unique one I've ever had. Reflecting back on the meal, I had some clear favorites. But honestly, even my least favorite was still tasty and delicious and would be a welcome snack on any day. Undoubtedly, the raw ingredients were of superb quality, and the overall experience was excellent. But nonetheless I have a few nitpicks. I was a little surprised that there were no special off-menu items that were offered to us, given that we had gone omakase. 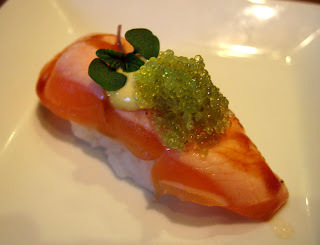 Of course then there was no 'omakase' per se listed on the menu, though it seemed like a standard request when we asked. Still, a place of this caliber should have some unique one-off specials to throw out from time to time. 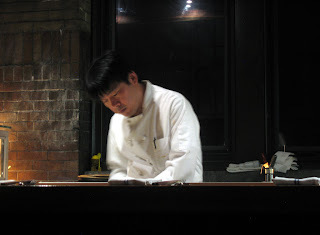 A sushi chef focusing on his work. The brick walls are a unique feature of the interior decor at O Ya, remnants of the restaurant's firehouse past. I didn't mention them, but we did order several desserts, which in context of the rest of the evening were forgettable. I also thought that they didn't fit stylistically with the rest of the meal. 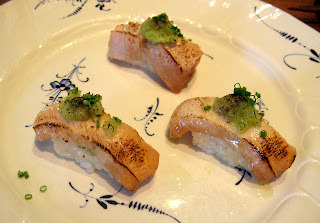 It's a pretty big challenge to make something that can rival foie gras nigiri and the like, but it has to be possible. It seems like any writeup of O Ya includes an obligatory reference to the cost, so I can't say that I didn't know what to expect. But it was steep for what a cynic might legitimately call a 14 pc. sushi/sashimi combo plus 5 or so 4-bite portions of cooked food... (dodging lightning bolts...) The meal was served at a leisurely pace but seemed to drag at times. So our 34 bites of food over 3 hours or so averaged out to just over 11 bites per hour. It was not the most filling dinner, to be sure, but I didn't need to binge eat afterwards either. 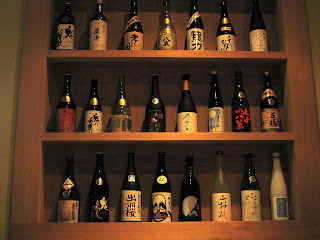 Sake bottles make a nice piece of wall art. For the sushi and sashimi items, I really wish I could have had more than one piece of each. They all were so full of such interesting flavor combinations, that just one bite made it tough to make a definitive taste judgement. I really wanted a second bite to confirm the first observation. And maybe a third for pure enjoyment. I know, I really could have doubled up or tripled my order if I wanted to. But I like my house and would like to be able keep it. Still, I resist the notion that it wasn't worth it, although for the casual diner, I would probably agree. We were served the absolute best ingredients prepared in a thoughtful and artistic manner. The flavor combinations were nicely conceived and unexpected, even if not the pinnacle of innovation. The warm service added to the experience for me as well. I would definitely return again, although I would probably forgo the omakase and take my chances on my own. Several of the items were good enough to warrant a reup, but there are plenty of other things on the menu that caught my eye. I'm guessing that with a couple of friends along for the ride, we could eat a bit less food, drink a lot less sake, spend half the money I did, and still leave happy. Maybe I'd have to skip the Wagyu , but I'm sure glad I got to have it once. A special thanks to those seated at my end of the table - I'm sure I annoyed you with my slow and deliberate photo taking, slowing you down in the process. A few of the photos turned out quite good, so I hope you think it was worth it! It would be fair to say that the last time I visited Bo Innovation, Chinese food had only begun to enter my culinary landscape. Not to say that this detracted from my enjoyment, but rather the lack of context afforded me the rare chance to taste and experience each dish in a vacuum - with no pretense of expectation to influence my judgement. It was a great experience, with some true standout courses. What is merely enjoyable in youth, however, is lustily savored as maturity sets in. Months worth of in-country visits and literally hundreds of authentic meals later, I am starting to scratch beyond the surface of Chinese cuisine, the complexity and scope of which is truly stunning. So when Tony Bourdain finally did a show about Hong Kong (it's about time Tony, really), I was totally jacked that he came to Bo, even if he was a year or so behind my pace. While watching the show, I was surprised to find that many of the dishes he was served seemed conceptually more familiar than the ones I recalled from my visit - no doubt a product of my newfound cultural exposure. Armed with this perspective, I thought it was time to revisit Bo Innovation - the most modern expression of this ancient cuisine that I know of - with the hope that my enjoyment will be enhanced this time around. Since my last visit, Bo has moved into a swanky new space off of Johnston Rd. 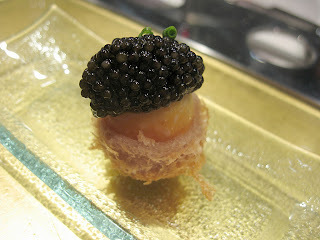 in Wanchai, a setting Chef Alvin Leung, Jr. believes to be more complementary to the cuisine. 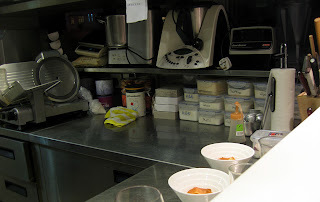 I chose to sit at the Chef's Table once again, because after all, why on earth wouldn't you? Seriously. This time Chef Leung was present to preside over the meal, offering commentary and instruction on how best to enjoy his creations. I asked him if he minded if I took photos, which prompted him to ask if I was going to write bad things about him on the internet. I think it best if I just let the food speak for itself. Century Egg with Super Sour Lemon Snow - As Chef Leung (or Alvin, as he introduced himself as) explained, strong alkaline chemicals are used to cure and preserve the egg, which despite it's hideous appearance, tastes remarkably like a hard-boiled egg. Trust me on this. The acidity of the lemon ice (low pH) is supposed to neutralize the alkalinity (high pH) of the egg, resulting in a harmonious combination in your mouth. Lemon and egg wasn't a combination that I would have thought of, but the effect was stunning. As I dropped the bite in my mouth, a cold, refreshing burst of sourness quickly faded away, leaving the hint of hard-boiled egg to linger pleasantly on my palate. I couldn't help but crack a smile and nod my head. In a word - genius. 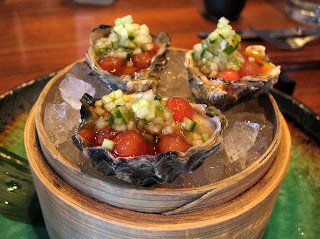 Oyster 2 Ways - On the right is an oyster garnished with flavors that represent the essence of Chinese flavor - ginger, green onion, and lime. 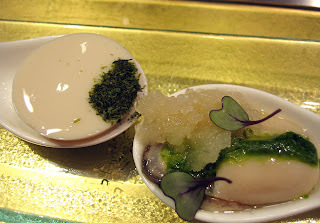 To the left is oyster tofu, a representation of the "taste of the sea." The fresh preparation was a dazzling explosion of bright flavors, ending with the smooth finish of the oyster's creaminess and salinity. I could have eaten a dozen or two of these, easily. The tofu, by contrast, was rather monotone and uninspiring. Tofu and I aren't really known to pal around often, so that may have contributed to my lack of excitement here. Smoked Quail Egg with Caviar and Crispy Taro Nest - A one bite canape, this dish was outstanding, matching the saltiness of the caviar (generously portioned) with the subtle smokiness of the egg. Fried taro, a staple of Cantonese dim sum, added the perfect complimentary crunch to bring it all together. 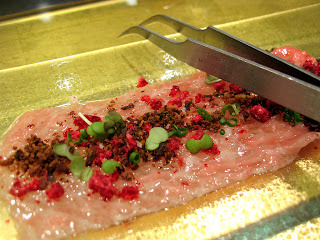 Toro with Foie Gras Powder and Freeze Dried Raspberry - We were presented with a thin sheet of beautiful fatty tuna belly (otoro), topped with a crumble of air dried foie gras and freeze dried raspberries. The foie, slowly dehydrated over many days, has shed its fat, leaving only the solids behind. 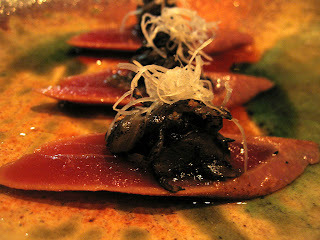 When chewed together with the fatty tuna, the foie is effectively reconstituted in your mouth. The raspberries add a fruity tartness that cuts the fattiness nicely. Plus, this plate just looks fantastic, doesn't it? I tend go a bit cukoo at the sight of glistening fatty toro and lose my sensibilities. Not simply a curious part of the presentation, the tweezers are actually a functional instrument here, as Alvin demonstrates. Fold the toro over to wrap the crumblies up inside, so that they won't all fall off on the way into your mouth. Just don't accidentally stick them through your tongue. 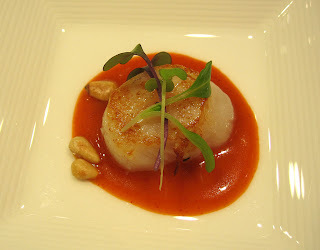 Sichuan Scallop "Jo Lo" - There's little I like more than a perfectly seared scallop. Here, it is paired with a Sichuan inspired sauce that was less pungent than I imagined, given that it contained sichuan peppercorn. While tasty, it was not a knockout. "Xiao Long Bao" - If you are familiar with xiao long bao, Shanghai's famous soup-filled dumplings, then you're probably looking at this photo with a quizzical look and a furrowed brow. Well that's the gag - there is no dumpling! 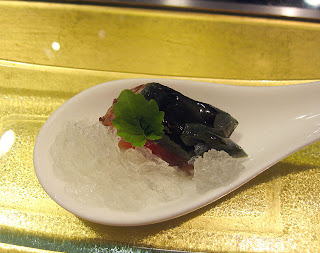 Borrowing a technique created by el Bulli's Ferran Adria, the liquid soup filling is served without it's traditional dough wrapper. Rather, the liquid is encapsulated in a thin gel skin which bursts immediately upon entering your mouth, creating much the same effect as eating a traditional xiao long bao. As my Chinese colleague said after eating this (after some initial confusion and skeptisim, "Wow! The taste... It's xiao long bao!" A clever application of this technique, for sure. 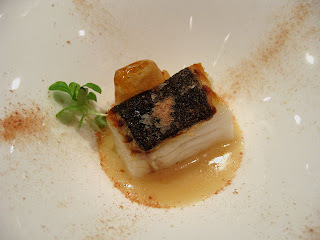 Pan Seared Halibut with Yunnam Ham Sauce and Toffee Salsify - This dish layers the richness of a nicely seared piece of halibut with the intense saltiness of a sauce made from dried Chinese ham. This combo would be good on its own, but is taken to another level by the addition of the candied salsify and it's contrasting sweetness. Simply incredible. I think everyone in my party agreed that this was a highlight of the meal. 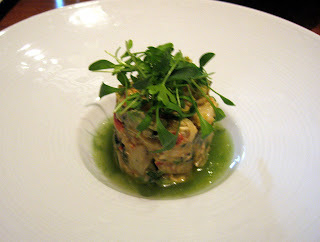 Crab Roe Souffle - The first of two crab dishes in this course, eponymously named "Crab 2." 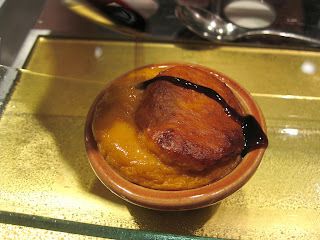 In the photo, you can see Alvin drizzling Chinese black vinegar over the souffle, which helps cut the richness. Fluffy and light, the souffle was intensely flavored with crab roe, a highly prized delicacy in these parts. Crab with Obha Mayo and Starfruit - This was a one bite reincarnation of a course I had been served on my last visit to Bo. Now, like then, it was delicious - the Japanese herb obha (aka shiso) adds a vibrant, mint-like punch that I really like with the sweet crab meat. 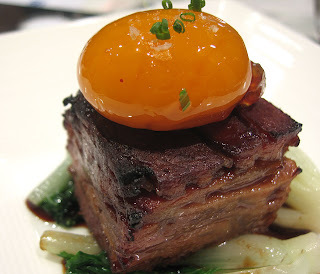 Chinese Roasted Pork with Vinegar and Egg - A novel take on traditional Chinese barbequed pork, this version is slow roasted for 24 hours, sliced thinly and then stacked in layers before being crisped up under the broiler. After eating heaps of the traditional version this week, which is quite fatty, I was happy to see that Alvin chose a leaner cut for his preparation. 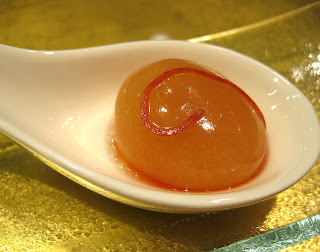 On top sits a sous vide egg yolk, cooked with vinegar at 50 C. This retains the vibrant color and creates a unique texture, where the yolk is almost like a caramel consistency on the outside, and still runny in the center. 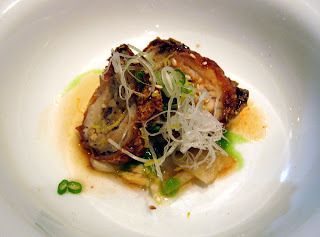 The yolk added richness to the dish typically provided by the fatty pork. Some token vegetables are thrown in and were quite good as well. Wagyu M9+ with Truffled Cheung Fan - The menu so far was pretty solid, but the sight of the word "Wagyu" made me culinarily aroused. Another typical Cantonese element, this time cheung fan rice noodles, being used in a non-typical way. Here, they are elevated to heights they could only dream about with a crust of black truffle, which makes them a fantastic accompaniment to the perfectly rare Wagyu beef. A small mound of truffle puree garnished the plate, adding to the earthy truffle intensity. This was a major highlight of the meal. As one of my colleagues said, "I'll take like, three more of those." 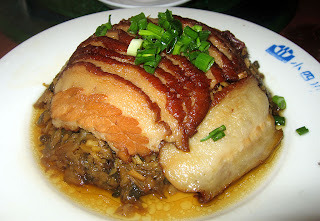 Bo Fried Rice - In typical Cantonese style, a rice dish is presented at the end of the meal. But that's about where the convention ends. Long grain, fluffy rice, while common in the US, is definitely NOT in southern China. 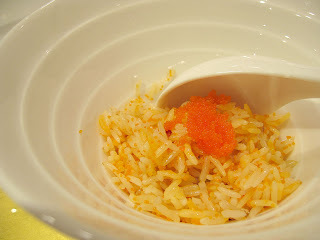 Nevertheless it was presented here with healthy portion of tiny fish eggs, adding both flavor and texture to the dish. It was good... but not great. 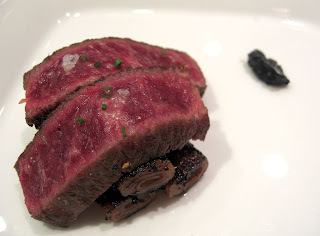 And somewhat of a letdown after the wagyu and truffles, but that's not exactly a fair comparison, now, is it? "Hong Kong Specialties" - Somewhat of an inside joke to native Hong Kongers, this course is a deconstruction of the ubiquitous Cantonese dessert, Red Bean Soup, literally "Red Bean Sand" in Chinese. 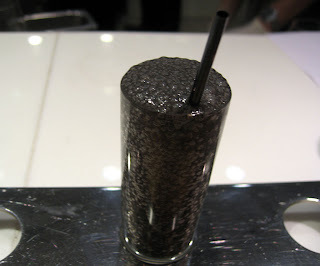 So it was with clever irony that we were presented with a spoon of red bean "sand" powder and a vial of black sesame seed foam. 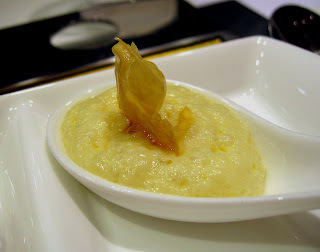 Alvin asked us to quickly combine them in our mouths to allow the foam liquid to reconstitute the bean sand, creating the familiar (well, familiar to Cantonese cuisine eaters) taste of the sweet, soft beans in the classic dessert. I appreciated the explaination, since the flavors would have otherwise had no significance to me. I'm not sure that the "sand" fully reconstituted though, leaving a dry powdery residue in my mouth. The one Hong Kong guy with us was thoroughly amused, I should point out. Ginko Nut Foam - The first item on a plate of three small desserts, ginko nuts are transformed into a whipped cream-like foam. It was lightly sweet and nutty. 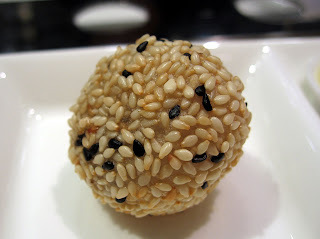 Sticky Rice Dumpling - Another classic, but chocolate and banana filled the center in place of the usual bean paste or sesame seed filling. Salted Kumquat Ice Cream - My favorite of the three, the ice cream was made from salted, preserved kumquats, so it was quite salty - which isn't a complaint, it is in fact the reason I liked it so much. 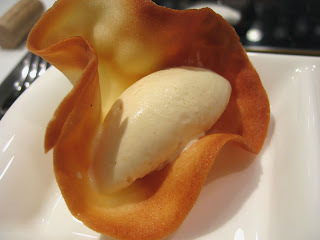 Taking a bite of the sweet tuile together with some of the salty, creamy ice cream was sublime. Apple Crumble - Sounds western, looks like a Chinese dumpling, and appears pretty straightforward - until you realize that the sphere that looks like a small apple is actually gelatinous, with a piece of apple only in the center. It is the final twist of this imaginative and exotic meal. Topped with a tasty crumble, I still couldn't help but wish that this was served a la mode, despite having just had ice cream on the previous dish (hey what can I say, I like ice cream). Some general observations about the experience - Alvin was involved in the final preparation of almost every dish that we ate. He gave us an introduction to and instructions for eating each plate, and was generally pretty talkative - even willing to share his methods and formulas for some of the more modern elements of the meal. 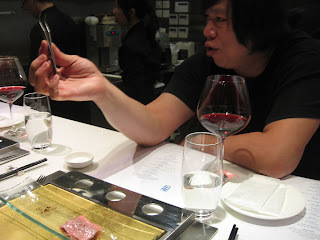 Granted we were at the chefs table, but, for example, he told us how he dried his foie gras, explained his process for the xiao long bao spherification (or reverse spherification, in this case), and described his method for cooking the egg yolks sous vide. He may not have invented all of these techniques, but he executes them quite well. 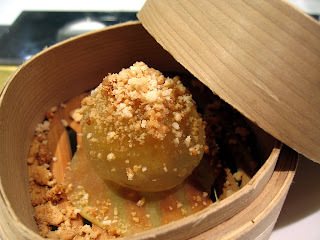 And I can't think of a better example of such techniques being used to create hypermodern Chinese dishes. A shot of Alvin's food chemistry playset. I asked a lot of questions about the ingredients, techniques, and special materials throughout the course of the meal. It seemed like he appreciated my interest and was happy to describe many of the techniques used throughout the meal. 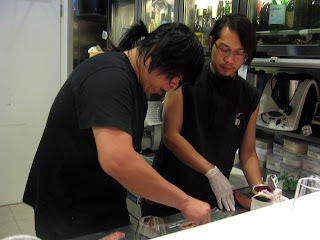 Alvin preps the toro/foie gras dish. I'll have another, please. The chefs table affords a view of the final prep and staging area. If you enjoy seeing how your plates come together, make sure you reserve these seats. Dinner at Bo is not just a meal - it is an experience to be contemplated and savored in its own right. To really enjoy it you must allow yourself to fully engage, deciding to observe all that your senses are telling you. This isn't a place you go to mindlessly shovel forkfulls of protein into your face. Anyone who is intrigued by modern cuisine should find something interesting here, but perhaps the best surprises are reserved for those who call Hong Kong home. My name is Rich, and I like to eat. I strive to keep you entertained with tales of my amateur culinary adventures and interesting travel experiences. I am not a serious writer, but I do take care to provide thoughtful commentary in my own humorous way. If you don't know me personally, welcome! I originally intended this site to help me keep in touch with friends and family, but don't let that stop you from taking a read. Please feel free to post comments and suggestions.